Hello, welcome back to Day 3 of my 3rd blogiversary giveaways. You can catch up with days 1 and 2 here on the competitions page. Blogging can be hard to fit in around a job and looking after your family. I spend every evening after my toddler has gone to sleep blogging away. When I’m at work I spend my lunch break answering emails, checking Twitter and Facebook for blogging opportunities as well as chatting away to my work colleagues. They know what I do so always asking me questions! I try to make the most of the time I have. Now I’m on maternity leave, my day is quite different. Until the baby arrives next month I’m getting ahead as much as I can. Well I should say I’m catching up on outstanding blog work first then trying to get ahead! I always start the day checking emails. Then at the moment I play it by ear and see how the day goes on what we do. I will tell you something, it’s nice not getting up at stupid o’clock to get ready for work! Over the past year I have made proper use of my blog planner and plan what needs to be done and by when. I’m much better at this 3 years down the line than when I started! 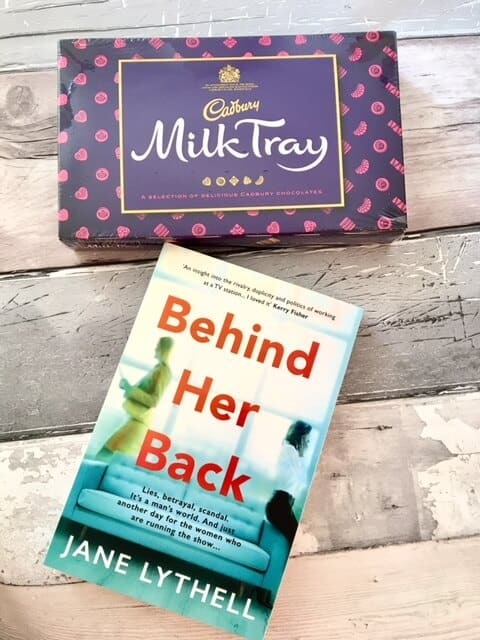 For today’s giveaway I have a small box of Milk Tray chocolates and a copy of Behind Her Back – which you can read the review here. *Terms and Conditions – There is one prize consisting of a small box of Milk Tray chocolates and a copy of Behind Her Back to giveaway to one winner. The prize is non-transferable and no cash alternative will be offered. The winner will be selected at random via rafflecopter from all valid entries and be notified by Twitter and/or email. The winner will have 28 days to respond with a UK address before a new winner is selected. Open to all UK entrants aged 18 or over only. Facebook and Twitter are in no way associated with this giveaway. Any personal data given as part of the competition entry is used for this purpose only and will not be shared with third parties, with the exception of the winners’ information. This will passed to Rachel Bustin and used only for fulfillment of the prize. Happy 3rd Blogiversary ! The book sounds right up my street, and chocolate too!! Thank you for running this giveaway. Chocolate and a book, what more could you want!? A book and chocolate, my two favourite things!! I am really trying to read more this year. I used to love it before I had children then I couldn’t find the time. This sounds like a real page turner! Perfect! We all deserve an indulgent treat like this now and again! A good book & some yummy cadbury Milk Tray. Sounds luxurious. What a lovely thing to do, I would be thrilled to bits to win! Wishing you a Happy 3rd Blogiversary. This is a perfect prize, I love delicious chocs whilst reading – absolute heaven. Chocolate and a good book – can’t beat it! Thank you. Congratulations on your Blogiversary, keep up the good work! Chocolate and books – perfect! Happy Blogiversary! Can’t beat a nice box of chocs when you’re curled up with a good book – the perfect combo! Would love to win, I love my kindle but love actually holding a real book as well. A good book and some lovely chocolate to read while I read it – a great combination. Thanks for the chance. A good book and some chocs sounds perfect. Love a good book, and the chocs would be a delicious addition! Oooooooo book and chocs! Just need bubbles and a bath and it would be #perfect! Love chocolate, and chocolate with a box too would be fantastic! Happy 3rd blogiversary, sounds like an interesting book. Congratulations on your blogiversary! Thanks for the giveaway! Happy 3rd blog Birthday, you have an amazing and interesting blog i really enjoy reading. Happy 3rd blogiversary 🙂 I think so many people believe that being a blogger is an easy job…from what I’ve seen as you say, it really isn’t! Enjoy the time off work and get plenty of rest too. I always enjoy your blogs especially from another Cornish girl like myself and living in this stunning county. i love reading, especially with chocolate!! Fab prize, my two favourite things! I’ve just finished a book..so need a new one to start! Good Book and Chocolates.The best combination. It was a beautiful day in Ipswich to day, I was quite brace and trimmed my labradoodles fur for the first time! Chocolates and a good book – perfect combo! How nice is this? A good book and a box of Milk Tray – heaven! Fab giveaway, the book sounds great. Lovely prize and happy blogiversary. I love a good book and I’m happy to read a variety of authors. Until your read these books who knows if you are going to like them. Oh yummy you can’t go wrong with a box of chocolates while your reading a good book. Choccies and a book, fab prize! Thank you for the chance to win some chocolate – the best kind of prize! Happy 3rd Blogiversary. What a great prize. Relaxing with a good book and eating chocolates. Bliss. Nothing like relaxing with a good book and chocolates. I’d love to win this, its freezing i have a cold and what nicer thing to do than sit by the fire with a box of choccies and a good book! i can’t believe you read every one! Chocolates and a book. What could be better?! This sounds like a great book and along with some chocolate it sounds like the perfect combination! Conblogulations! Have a fab celebration and treat yourself! Lovely prize, thanks for the chance. Good luck everyone! Happy blog birthday! This looks like the sort of book I’d love! A book and chocolate – the perfect combination! This is a lovely prize,thank you.This is the type of book I read all the time. And all because the lady loves….Milk Tray AND a great read! A little indulgence . Thank you . very nice giveaway and Happy Blogiversary! !